ICR > Blog > General > Seven ophthalmologists from ICR among the peer-reviewers of the journal Archivos de la Sociedad Española de Oftalmología. 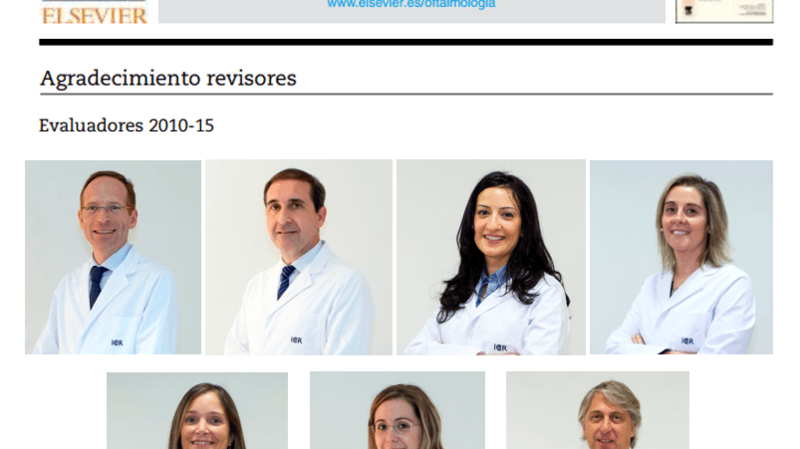 The Editorial Board of the journal Archivos de la Sociedad Española de Oftalmología published a communication in its website recognising the collaboration of renowned Spanish ophthalmologists that have participated in peer-reviewing manuscripts for the journal for the last five years. Archivos de la Sociedad Española de Oftalmología is the official journal of the most significant Spanish ophthalmology society, the Sociedad Española de Oftalmología (Spanish Society of Ophthalmology), that currently has over 4000 members. The journal is aimed at publishing research works from several domains in Ophthalmology and its subspecialties, including revisions, original articles, editorials, letters to the editor-in-chief, clinical practice guides, etc., from which a small part are saved for the Society’s annual congress, that will be held next week. Moreover, even though it is published in Spanish, all articles are translated into English for increased dissemination. This has placed the journal as the only ophthalmology journal in Spanish indexed in PubMed/MEDLINE. All the manuscripts assessed for potential publication are sent anonymously to expert ophthalmologists in order to be rated. We would like to congratulate them for their work and for the recognition this entails. From ICR, we’d like to thank our ophthalmologists professionalism and encourage them to continue seeking excellence both in patient care and in the research field.